He then compared the revolutionary periods of 1848 and 1989. In both of these cases, revolutions broke out in several countries in quick succession. While the uprisings were similar in many respects – in terms of mobilization tactics, for example – the outcomes differed. Why was this? Because revolutions never take place in a void: their social, political and economic context matters. In different contexts, we are likely to see different outcomes. Germany and France in 1848, for instance, had conservative governments and “somewhat immature” citizens. German and French intellectuals therefore could not count on strong grass-roots movements, which may help to explain why the revolutions of 1848 did not initially lead to lasting change. In 1989, by contrast, the outcome was different and much more complicated. Put bluntly, Eastern Europe democratized, Central Asia became the home of some of the most repressive dictatorships in the world, and, in Russia, Boris Yeltsin made good use of the 1990s to lay the groundwork for authoritarianism (Mr Goldstone added that, far from being a totalitarian system, Russia today can be called “a weak democracy at best”). The distinctive factor of the revolution of 1989 was, Goldstone argued, that the communist ideology was on the way out. This meant that there was room (and indeed the need) for new ideas and visions for the future. This illustrates the importance of national identities in times of revolution. For revolutions, if successful, give people new direction and identity. National identity, however, can take different forms. It can be associated with democratic ideals, which is what happened in Eastern Europe, where Western European identity had a strong influence. Or it can include authoritarian traits. To varying degrees, the rest of the former Soviet Union (i.e. Russia and Central Asia) went down that latter road. As such, taken as a whole, the 1989 wave of revolutions was more successful than 1848 – though, Goldstone concluded, that success was limited to Eastern Europe. Now, how does this compare to what’s been going on in 2011? Mr Goldstone explained that the starting context of the 2011 revolutions in the Middle East and North Africa was rather different from 1848 and 1989. With the exception of Saudi Arabia, most Arab states had been modernizing their infrastructure, educational systems, tourism industries, and so on, for a number of years before the outbreak of the revolutions. The economic structures in place were more modern than in the examples discussed above, too. In other words, at the beginning of 2011 the citizens of Tunisia and Egypt in 2011 had been much better educated and more active than the people of Germany and France in 1848 – and that’s a crucial factor. The political systems, on the other hand, remained repressive and conservative in most Arab countries, which is arguably the most important similarity to the general situation in 1848. At this point Goldstone made an interesting remark about the types of government that exist in various countries. In revolutionary times, it matters a great deal whether a country is ruled by a monarchy (see, e.g., Saudi Arabia, Jordan), a military junta, or a personalist dictatorship (e.g. 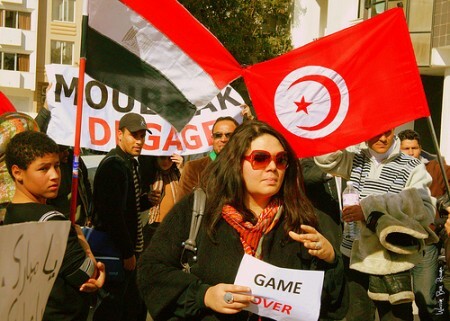 Egypt and Tunisia pre-2011; Syria now). Personalist dictatorships are the most vulnerable ones because so much power is concentrated in one single individual. In Mr Goldstone’s opinion, such a concentration of power leads to flawed political structures that easily crumble once a dictator falls. The most prominent recent examples of this are Tunisia and Egypt (and Syria may be next in line…). Dictators such as Hosni Mubarak depended heavily on the support of their country’s political and economic elites, as well as the military. If personalist dictators lose the elite’s support they fall. In the absence of a strong bureaucracy and some other significant source of legitimization, the government and its ideology crumbles along with its central figure, leaving behind a power vacuum – and an opportunity for change. The degree and nature of this change depend to a large extent on who (or what kind of institution) fills the vacuum. This brings us back to a factor that, according to Goldstone, plays an important role in revolutions: ideology. As mentioned above, ideology was important in 1989, and it has also been important in 2011. But there is a crucial difference between 1989 and 2011. In the former case, the dominant ideology, Communism, was on the way out. In 2011, a hitherto suppressed ideology, Islamism, actually played a supportive role and has been on the rise. Although Islamic parties in Egypt and Tunisia had been marginalized for decades, they had a pre-existing network of contacts that proved to be very useful when it came to mobilizing the population during the revolutions. For example, Goldstone mentioned that the Muslim Brotherhood played an important role in organizing the national strike in Egypt at the beginning of 2011, which ultimately led the military elites to abandon Hosni Mubarak (because shooting at people doesn’t make them go back to work again), whom they had, until then, supported. So how is it all going to end? While the rise of Islamist movements is feared in many quarters, Mr Goldstone is more positive about this development (remember: “troubled democratic outcomes”). At least, he thinks, this will hold true as long as there is no strong external threat or shock. A war, such as an Israeli strike against Iran, or a deep economic recession would change everything, especially in that it could radicalize Arab societies. This, in turn, could throw back or even stifle any transition towards democracy. But so far, such an external shock has not happened, which is why there is reason to be cautiously optimistic.